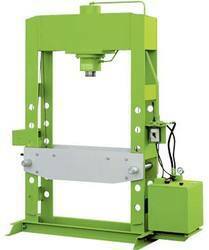 We are one of the leading manufacturers, suppliers and traders of the premium quality of Hydraulic Press. For manufacturing the offered presses in compliance with the industry set norms, our engineers make used latest machinery and equipment. Their low vibration, reduced noise and minimum maintenance, makes these presses highly demanded.